Now that we have our sweaters on, you may think the best time for pool maintenance has passed. Think again! It turns out that winter is a great time to order an outdoor pool renovation. It also serves as an ideal season for pool maintenance. If you wonder when to add a pool enclosure, wonder no longer. 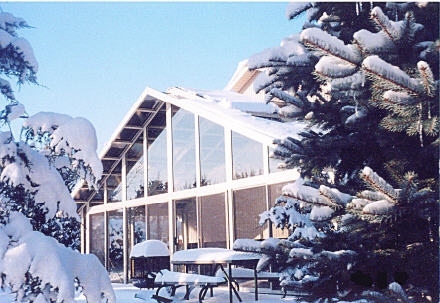 Not many folks think to call their local pool enclosure service during the winter. But, you have a lot to benefit from if you schedule a visit during the colder months. We work just as hard during winter as we do during the summer! You see, businesses like our own actually have more flexible scheduling during the winter. The extra room in our schedule makes it much easier for you to pick a date and time that works for you. Maintaining your pool and enclosure every season lets you catch any damage before it gets worse and prevent further costs. Repairing small issues keeps the whole enclosure in great shape! Keeping an eye on your enclosure’s condition also prepares it for any storms or bad weather that can come up. When summer storms come around, you’ll have weather-proofed your swimming paradise months in advance. One of the most fun steps in getting a pool enclosure is deciding on an appearance that fits your lifestyle and matches the rest of your property. You can use the extra time winter gives you to think about what your dream enclosure will look like. Taking care of your enclosure maintenance or addition early on lets you enjoy your pool as soon as it gets warm enough to swim. Instead of making an order and waiting for your renovations to finish before you can make a splash, you can have some summer fun right away! Having an enclosure also eliminates the need to remove a pool cover and re-establish the chemical balance in your pool. So, instead of having to do tons of preparation, you can use that time to enjoy your pool. If you can’t wait until summer to go swimming, you can have an enclosure built that will keep your pool warm all year. Our enclosures don’t just protect your pool from the elements — you can also heat them to let you swim 365 days a year! Ready to set up a winter renovation? All you need to do is find the right company to do the job. Have you considered us as a candidate? We’ve helped customers find the perfect enclosures and retractable roof systems for over fifty years. And we provide services all year long! Contact us to get more information about our services and a free estimate on your renovation.